On a map of the area, I see Beharrell Road and I think that was the road I’m remembering. We knew the Beharrell family who had a farm nearer Pringle’s Store at Ridgedale. We stayed with them once on our way back to Victoria from Halifax where my father had been stationed for two years. There was a horse and I was allowed to ride it. 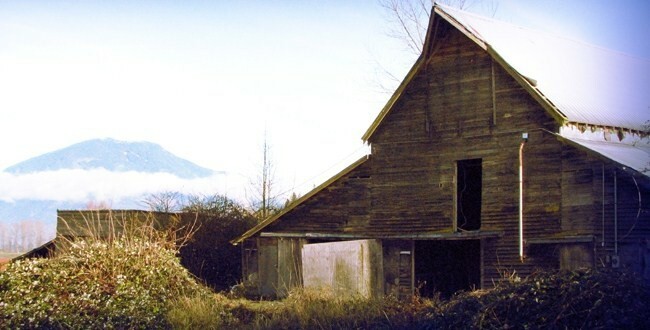 A barn with hissing cats protecting nests of tiny kittens. A huge dining room table that we sat around for a dinner of rich food and where I hoped the meal would go on forever. It was a house with dim cool rooms, windows shaded by full trees. My heart would explore, find corners I couldn’t bear to leave, chairs emptied of their generations of inhabitants. Another farm, on Fore Road, also took me deeply into its fields and rooms, the high reach of its hayloft. The daughters of the farm babysat my brothers and me on the occasional evening when my parents went out, and from that contact, my parents got to know their mother and father: Skinny and Myrtle Gillberg. We bought milk from them, one brother going over on his bike with a gallon jar in the carrier. Their farmhouse was turquoise and old, without an indoor bathroom, though there was a toilet of sorts in the cellar. (We stayed with them sometimes and what a decision if I had to pee after dark: to the outhouse behind the house itself, smelling of active bowels and lime, dense spiderwebbing in every corner, and loud with flies; or else down the cellar with a candle or a kerosene lantern?) A tree by the front door trailed tent caterpillars summer after summer and Mrs. Gillberg was afraid of them. If one landed in her hair, she’d scream. This amused my brothers but I have to say that I hated the feel of them on my own face or in my hair. Their whiskery bodies made my skin crawl and their guts were horrible. There was a couch in the Gillberg’s living room which had survived the flood of 1948. I’d press my face to its shaggy arms and imagine I smelled the river. To get to the second storey in that house, you had to creep into a closet in the one bedroom on the main floor, push aside the dresses and winter coats, and find a narrow flight of stairs. The daughters slept up there and one of them smoked, hanging out the window so her parents wouldn’t smell the evidence on her when she came down from her tower, smoothing her hair as she emerged from the closet. There was a partly-subterranean bunker by the road where the milk cans were kept for pick-up – this was before milking parlours, before pumps. The bunker was cement and very cool, even on hot summer days. Once my older brothers tricked me into going down into it by myself, later in the day after the milk had been collected, and once I was there, they closed the door, telling me that when they turned the knob a certain way, water would fill the small space. There was a bench and I sat there, waiting for the end. It didn’t occur to me that it might be a joke – I saw nothing funny in the prospect – and I remember crying softly as I waited, thinking of everything I would miss: my teddy bear Georgie, our dog Star, Christmas morning, the taste of my mother’s chocolate chip cookies, warm from the oven. When my brothers finally opened the door and helped me to the surface, they begged me not to tell our parents. Mrs. Gillberg had soft arms and she made the best pancakes I’ve ever eaten, richly coloured from the eggs we hunted for in the barn or outbuildings, sometimes finding them still warm from the hens. She’d fry bacon from their own pigs and let us drink coffee well-diluted with milk. And the milk! The jugs she brought to the table had thick layers of cream on top. If no one was looking, I’d scoop it out with a finger. She made pies and biscuits and cakes yellow with eggs and cream. If I’d wondered before where dairy products came from, I knew after one or two meals at her table, having seen the jars of milk come into the house and those eggs on her counter waiting to be wiped. (It hadn’t occurred to me to wonder how the hens produced them.) And if we timed our visits to the barn just right, we could see Mr. Gillberg or his hired man Chappy on three legged stools, cheeks against the cows, squeezing milk from their udders into metal buckets while cats waited in the shadows. On summer mornings, sunlight poured through the open loft doors, where haybales were thrown from the wagon, fresh from the fields, and swallows entered like swift wishes, dropping feathers which we caught in mid-air. My father tried to teach my mother to drive along Beharrell Road. It wasn’t a success. She knew the basic rules about steering and how to use a clutch. She’d practised with him along the boulevard in front of the radar base’s housing, my brothers and I watching from a safe place, while she ground the gears and reversed in a wobbly line. When they went out for road driving, they had to take us. We were warned to be silent but it was hard not to scream when my mother drove us into a ditch, my father shouting in exasperation as she wept into her hands over the steering wheel. ~ by theresakishkan on April 30, 2013. This entry was posted on April 30, 2013 at 6:33 pm and is filed under Uncategorized.You can follow any responses to this entry through the RSS 2.0 feed.You can leave a response, or trackback from your own site.